Get started with our free mini course! The course contains sample recipes, tips and all of the practical info you need to get started. You guys. I am in love with salads. There are two major reasons why – First off, they require minimal time to prepare and secondly, they are the easiest way to embrace a clean eating lifestyle. My kids love them because they have fun tossing the veggies and fruits together in the mixing bowl. It’s sort of a bonding time for us; I chop and they toss. The thing with salads though is that if you’re not careful they can get old and boring quickly. I’m constantly on the lookout for ways I can get the kids to eat their greens. But, it’s more than just that, I personally feel that in order to maintain my clean eating lifestyle I need to keep things fun and interesting and trying new recipes is a great motivator for me. In this roundup, I found Asian, Caribbean and Mexican clean eating salad recipes that blew me away. In my search, I also found a way to make use of all those leftover veggies- the ones that are begging to get used yesterday! Some of the salads are so easy to make, they don’t even require a recipe. But don’t take my word for it, take a gander below and tell me what you think. The name says it all- this is truly summer in a bowl. In the most deliciously epic way possible with steak, fruits and vegetables. Thanks to the protein and the fiber, this lunch will also leave you satisfied for hours. Get the recipe here. It’s salad, but all wrapped up! Nourish your body with this fresh veggie spring rolls; the peanut dipping sauce is not only a healthy option but it complements the salad quite nicely. Get the recipe. Here’s a great use of leftover veggies; the result is a salad rich in fiber, low in calories, and bursting with flavor! Get the recipe. This salad is quick and easy to make plus it’s packed full of vitamins and minerals. I particularly love this salad because it takes almost no effort- throw everything into the food processor, let it do all the dicing and slicing and voila! I look like the hero. Get the recipe. Is this not the most beautiful salad? Look at all those gorgeous colors! I can tell you, it tastes even better than it looks! Get the recipe. Making a bowl of salad doesn’t get any easier than this. Get the recipe. Radishes are quite versatile, you can either enjoy them pickled, raw or cooked. In addition to that, they supply the body with about 25% of the daily recommended value of Vitamin C. Get the recipe. This salad is delicious and also quite crunchy… thanks to all those veggies and crunchy almonds! What’s not to love? Get the recipe. This salad has a myriad of colors, flavors and textures- no way will you get tired of salad with this bad boy in your salad arsenal. Consider yourself warned- this salad tastes just like fall should and is majorly addictive! Get the recipe. This salad would also be great with butternut or acorn squash or even pumpkin, but if you’re up for a little adventure try it with the original kabocha squash and you may discover a new fall favorite! Get the recipe. Cool food fact: the vitamin C in strawberries helps your body absorb the iron in spinach. But you didn’t need to know that to want to try this flavorful summery salad. It’s got strawberries, avocado and pecans, that’s what you needed to know! Enjoy. Get the recipe. Creamy avocado meets bright, citrusy oranges. And then you toss it all together with quinoa, corn, onion and cilantro. This Mexican inspired salad will have your taste buds saying “ole!” Get the recipe. 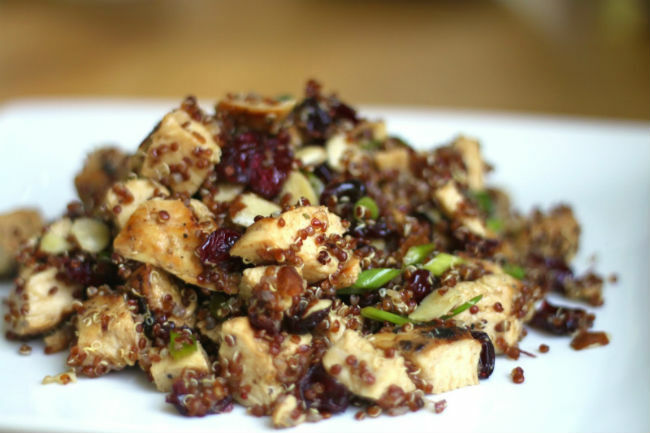 This quinoa chicken salad is rich in protein, it gives you that feeling of fullness without making you feel overfed. Get the recipe. This sweet potato salad is as healthy as it looks, the quinoa and chickpeas work together to give your body the protein it needs. Get the recipe here. Getting tired of all those raw veggies? Why not grill them for a change? Get the recipe. …and here’s a genius way to incorporate sea food into your salad. Although it calls for quite a number of ingredients, I assure you the end result is worth it. Get the recipe. This recipe couldn’t be simpler: wash, cook, chop and serve. Get the recipe. This 5-minute salad, is gluten free, diary free and paleo friendly. It really doesn’t get any cleaner – or more delicious-than this. Get the recipe.